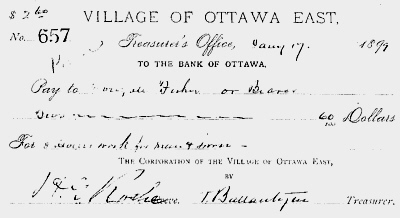 The first year of existence of the Village of Ottawa East was 1889. From that point until December 1907, detailed records of the council activities for each and every year. The record from 1889 to June of 1898 has been lost. The microfilm available for the council minutes starts in June of 1898 and is complete to the end. Various reasons have been given for the loss of the original documents including fire and water damage. Notwithstanding this sincerely given reasoning, this writer will keep on looking! Remember the final scene from "Raiders of the Lost Arc" when the guy stores the arc in this never-ending warehouse. Certainly there is no logic in this quest but hey . . it’s better than golf! We do know a few things about the period from 1888 to 1898. The Ballantynes played a major role. James was the Reeve for the first seven years years and his brother Thomas served as treasurer. Thomas' son Henry designed the Town Hall.